Nice, small campground. No pool but did have a little dog area with trees. Sites were small but RVs were not on top of one another. There is a train yard behind the park but could not hear the trains very much with the AC running at night. Friendly staff. Lyft or Uber was 20 minute drive into French Quarter. Felt safe and clean. Would stay there again. We camped at Three Oaks and a Pine in a Fifth Wheel. Bus stop right across the street. We used Uber and Lyft most of the time. Try Willie Mae's Famous fried chicken restaurant. Best sides and chicken ever!! 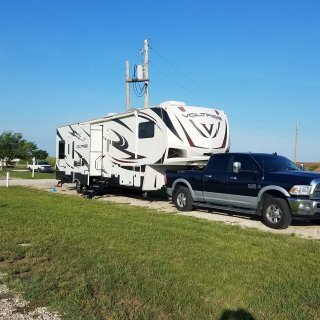 No frills RV park in middle of corn fields. We were the only campers when we passed through headed to Sturgis. Clean and quiet with no street lights to shine in the windows. Only stayed about 10 hours so did not see anyone at all. Left our money in a small box at front. Would stay there again if passing through. 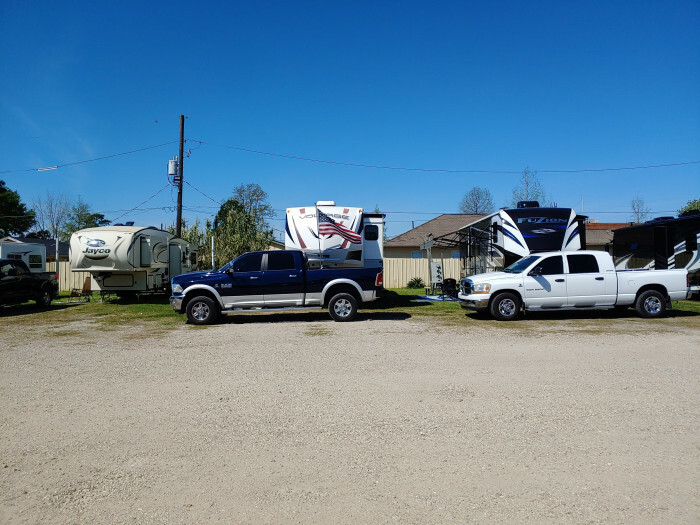 We camped at Oasis RV Park in a Fifth Wheel. Only a stop over from 10 pm to 7 am. Not sure if there was anything around. The park was clean and quiet. I had no issues with the front office. They were nice and informative. Firewood was available for purchase for $6 a bundle. Close to many stores and restaurants. Our site 35A was not long enough nor wide enough for our 2500 Ram after unhooking from the 5th wheel. Luckily 35B was occupied by a very small van so we could park slightly on his lot. Took some maneuvering to get into spot due to small oak tree almost directly in the middle front of the lot. We camped at Nova Family Campground in a Fifth Wheel. Eat at Giuseppe's near the park. Try to arrive before dark due to many trees in the park. Very nice park. Not many parks that you can wake seeing peacocks and emu outside your window. Dog park is very spacious and clean. Pool was good size. Overnight camping is back to back but very easy to pull out when leaving. Park host helps you set up if needed. Would definitely camp here again. We camped at Travelers Campground in a Travel Trailer. Visit the Bat house on UF campus. 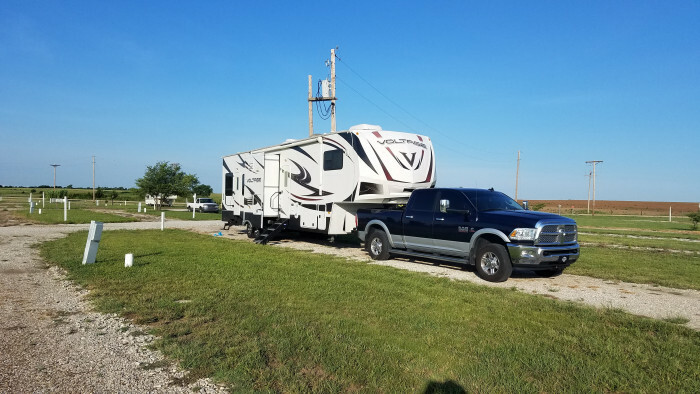 Each campsite has plenty of room between them. Springs are about a mile away from the campground but easily done by bike. Several trails lead into the campground. Saw several turkeys and deer. Rangers were friendly. Springs were nice but crowded. Prices at gift shop were reasonable. No seeums were bad around 3-5 pm. We camped at Wekiwa Springs State Park in a Travel Trailer. Bring bug spray! No seeums were very bad during several hours a day. Biking is the best way to get to the springs. Bring a lock for the bikes because they are not in visible when you are in the springs. Very nice stay. We were in #171. Nice and long campsite but very narrow, with brush on each side. Nightly a herd of deer would wander within 5 feet of us heading back into the forest. Beautiful park in itself with water surrounding you. Will definitely be going back next year!! We camped at Saint Andrews State Park in a Travel Trailer. Capt Jack's AYCE seafood buffet was very good. Well worth the price. Make sure you bring your bike to ride the whole park. Most of the sites are pull through. Very shady. Park hosts friendly. Close to the interstate so easy in, easy out. 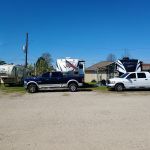 We camped at High Springs Campground in a Travel Trailer. Pleasant clean park with friendly owners. Pool and jacuzzi were very clean. Owners assist you in backing into the sites. Area the park is located is sketchy but park is gated and felt very safe. Rode the bus to French Quarter and never felt scared. Trip took about 45 minutes to get to the quarter. Dog area was nice and clean. The park has gravel road with gravel sites and nice grass and picnic table. Would definitely stay here again. The park is a gem. Spots are very tight but owners back you in with no problem at all. 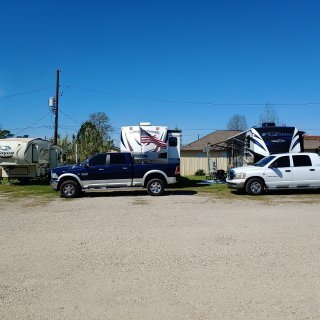 We camped at Jude Travel Park in a Travel Trailer. Definitely get the jazzy pass for the bus service. $9 for 3 days (can't beat that price) Did not have any issues taking the bus day or night. bus stops coming and going right in front of RV park. Owner was very personable. He personally helps you to your site. Pull thru site was wide. Bathrooms were older but clean. Lots of wildlife. Definitely will be back to this campground. Nice level sites paved with gravel. We camped at Cherokee Campground in a Travel Trailer. Eat at Valentine's at Tanglewood, right down the street from the campground. Good home style cooking. "Enjoyable safe park directly on the water"
A great place to camp. Lots of shade trees, ample room to park an rv (we have 35 ft tow behind). The lots on the water are 5 feet from the water. Will definitely book one of these next time. There was security at night checking anyone coming into park. Clean showers, laundry room and pool. General store on site in case you forgot anything. Getting down to Duvall street was not a problem. If you want to rent bikes or scooters a company would deliver and pick up from the campground. No problem accessing the wifi. 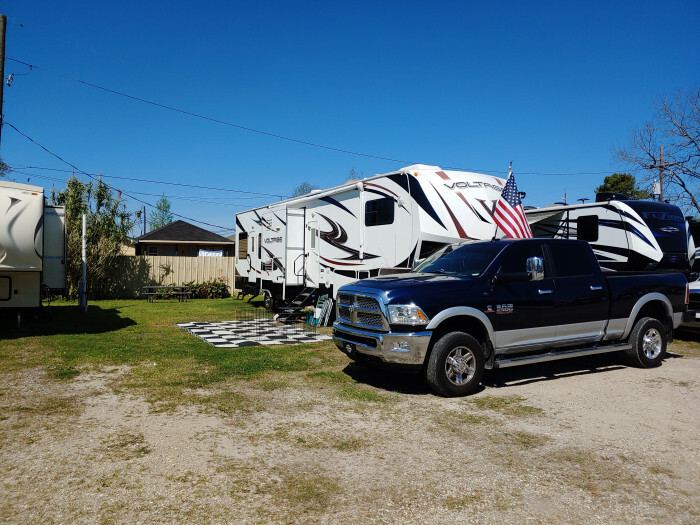 We camped at Boyd's Key West Campground in a Travel Trailer. Can rent bikes or scooters from company that delivers to campground. Park was very clean and nice with lots of shade trees. Park was quiet even though we were there during Bike Week. Clean bathrooms with plenty of large showers. Friday and Saturday night a band played at the pool. The only issue we had was during check in was our spot that we reserved was given to someone else. We ended up with a better spot so they were very accommodating. We learned from past guests the rate was increased quite a bit for the weekend due to the events going on. I would definitely stay again. Close to Daytona without being in all the traffic. (Lot spacing was nearby and mostly shady. Site surface was a concrete pad and featured a picnic table and patio.) We camped at Encore Sunshine Holiday Daytona RV Resort in a Travel Trailer. Very nice front desk gentleman. Was able to book same day. Lot we were put on was a little tight to maneuver with our 31 foot rv. Space between concrete pad and electrical post was about 9.5 feet. Clean baths, nice clubhouse. 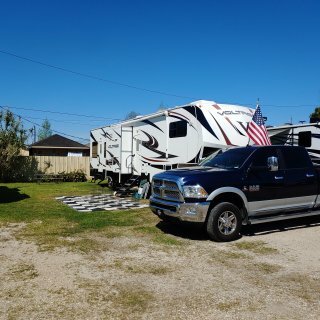 We camped at Spanish Main RV Resort in a Travel Trailer.